Thermidor – Here is another main characters – Armandine’s mother, Emerance de la Marne! Here is another one of Thermidor’s main characters – Armandine’s mother, Emerance de la Marne. A noble aristocratic woman and a devoted romantic. She is one of the few people who knows her husband’s true intentions toward the common people. She knows why he helps them and why he wants their daughter to marry another aristocrat, but no matter how much she tries, she cannot bring herself to agree with marrying their daughter off like that. She believes in the significance of love and that sometimes pain is the price of true love. Even though they have been together for many years, there is still something that always bothers Emerance about her husband, Camille. 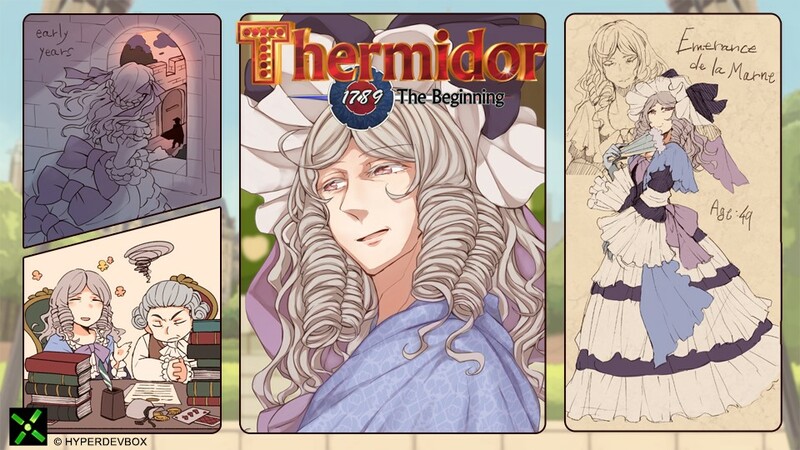 Don’t forget that there is a chance to win a framed picture of one of Thermidor’s main characters, signed by the HyperDevbox staff, (http://hyperdevbox.com/?p=5433) if you answer the most correct answers in our #dailyquiz contest! https://hyperdevbox.com/wp-content/uploads/2016/09/1789T_EN_640x240.png 240 640 hdxeditor http://hyperdevbox.com/wp-content/uploads/2014/10/HDXLogo_340x156.png hdxeditor2016-10-25 21:21:112016-10-25 21:21:11Thermidor - Here is another main characters - Armandine's mother, Emerance de la Marne!